Premise: Frank Blackthorne is a not-so-great thief on the run after accidentally disrupting a virgin sacrifice to a Dark Lord. After rescuing the virgin, he finds himself in need of an escape from an entire kingdom. 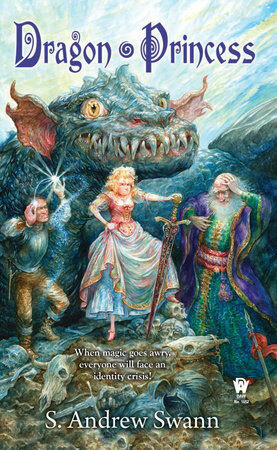 When a wizard approaches him with an offer to help save a princess from a dragon in exchange for the princess' hand in marriage, he's rightfully suspicious, but also out of options. Of course, the rescue goes horribly wrong and suddenly he finds himself trapped in the princess' body and deposited in the middle of nowhere. Now he has to find his way back, find the wizard, and hopefully get his own body back! Again, this is intended to be a fun, glorious romp through all of the fantasy tropes you've grown to love and it's exactly that. The twist, of course, is the body swapping, which S. Andrew Swann handles wonderfully. The moment I started reading, I was caught up in the story and the adventure dragged me along and kept me interested, with likeable characters (a must for these types of books) and a plot that unravels and gets more complicated the more Frank finds out in his search for the wizard. The best part of the novel is that the plot hinges completely on the four major characters involved (princess, dragon, wizard, thief) and that each of those characters has their own story, their own motivations, and all of them are completely believable.